The Notre Dame Irish travelled north to face-off the Michigan State Spartans on Saturday. The Irish men and women swept MSU 188-10 and 196-101, respectively. The Notre Dame women won 11 of their 16 events and exhibitioned non-winners in the remaining 3 events of the meet. The Irish kicked off the meet with a win in the 200 medley relay with a 1:41.77. Madeline Laporte and Sinead Eksteen followed up their wins in the 1000 free (10:17.70) and 200 free (1:50.15) for the Irish, respectively. Samantha Villani earned MSU their first victory in the 100 back (56.65). Ana Sortland followed up with her MSU teammate and won the 100 breast (1:03.23) for the Spartans. Ellie Roche repped the Spartans in the 200 breast with her winning time of 2:19.24. Shortly after, Abbie Dolan (500 free, 4:49.18) and Skylar Fore (100 fly, 55.89) won events back for the Irish. Luciana Thomas earned her second victory of the meet in the 200 IM (2:03.72). The Irish women sealed the deal in the 200 free relay with their win of 1:33.28, aided by Abbie Dolan’s 22.50 anchor split. The Notre Dame men won 12 events over the Spartans on Friday. The Irish started the meet with a pair of dominant wins from the 200 medley relay (1:30.49) and 1000 free, won by Zach Yeadon (9:16.84). Notre Dame’s Sadler McKeen took double wins for the Irish in the 200 free (1:38.86) and the 200 back (1:47.43). The field was very tight in the first 50 of the 100 breast, with Notre Dame’s Rex Riley taking the early lead in a 26.77. However, MSU’s Jonathan Lee came back on Riley with a 29.70 to win the event in a 56.73. Riley finished behind Lee in a 56.94. 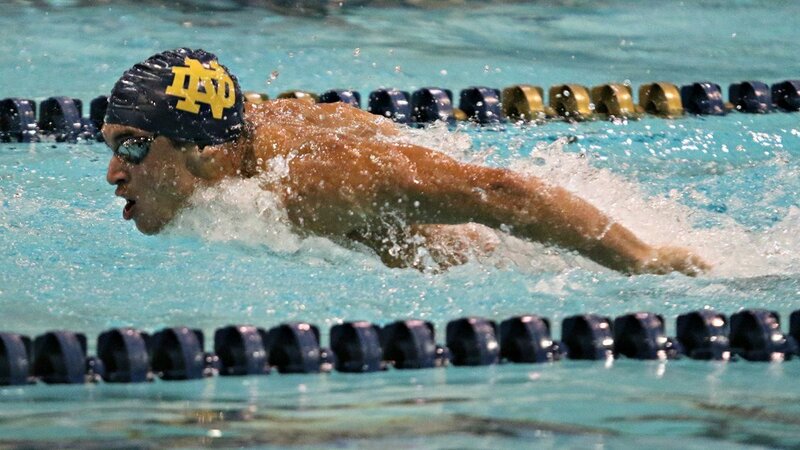 Meanwhile, Notre Dame’s Matt Grauslys took 2 butterfly wins in the 200 fly (1:47.99) and 100 fly (48.76). Yet the 50 free had a close duel between Notre Dame’s Tabahn Afrik and MSU’s Payton Woods. In the end, Afrik out-touched Woods by one one-hundredth to win with a 20.77. Afrik (45.18) teamed up with Zach Yeadon (46.35) in the 100 free to go an Irish 1-2 finish. Woods took third behind the duo in a 46.40. Notre Dame and MSU had a thrilling battle for the last hurrah in the 200 free relay. Notre Dame took the early lead with Tabahn Afrik’s 20.76 lead-off split. But MSU’s Payton Woods popped a 20.13 to put MSU in the lead. MSU held onto their lead and won their third event over Notre Dame 1:22.23 to 1:22.42. On February 20th-23rd, the women of Notre Dame can be seen at the ACC championships while the MSU women will be at the Big Ten championships. The men of Notre Dame and MSU will be featured in their respective conference meets February 27th-March 2nd.